The village of O’Briensbridge stands on the eastern verge of Co.Clare, on the right bank of the river Shannon – the longest river in Ireland. The bridge which gives its name to the village stands across the Shannon, and has at its east end, in Co. Limerick, the village of Montpelier. The section of the river downstream from O’Brien’s bridge is noted for angling and watersports. Upstream at Parteen the flow of the Shannon is diverted into a man-made canal (called the Shannon Headrace) for a hydroelectric station at Ardnacrusha. 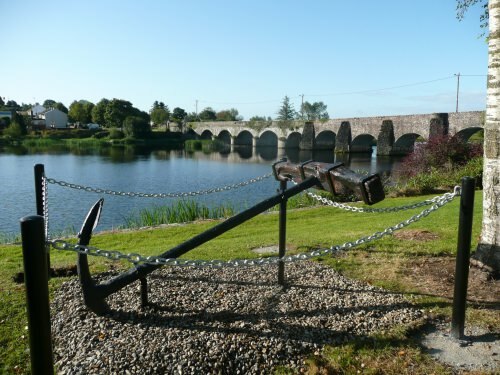 The Errinagh Canal was built to allow navigation of boats and barges to the City of Limerick. Today, the canal is being developed as a recreational amenity (fishing, watersports, etc) – the loop uses what was the towpath for horses as they pulled barges along the waterway in previous times. A-B. Starting from the riverside car park, follow the pathway along the River Shannon away from the village. You are following the blue arrows on the waymarkers, but there are also red arrows (for the longer Old Barge Loop) and the yellow arrows of the Lough Derg Way (a long-distance walking route which goes from Limerick City to Killaloe). The pathway soon enters an area of natural woodland along the bank of the river – this was the old towpath. After 1km the route swings right as you join the Errinagh Canal. B-C. Continue to follow the sandy path along the bank of the canal to reach Errinagh Bridge. Go under the bridge, and on your exit, climb the embankment where you will turn right following the blue arrow. Notice that you leave the Lough Derg Way at this point. You also leave the red loop as it turns left towards the village of Clonlara. C-D. Follow the blue arrows onto a tarred roadway. Turn left and almost immediately turn left via a gateway/stile into a field and onto the embankment of the Shannon Headrace, where you rejoin the red loop on its return from Clonlara. Turn right on top of the embankment. D-E. Follow the right bank of the headrace for almost 2km to exit via a stile at the end of forestry and onto a roadway. Continue straight here. E-F. After 300m enter the village again, turning right as you join the tarred road. F-A. Follow the road through the village – enjoying the 200m back to the trailhead.